If you want to unwind after a long day or just spend the night out with friends visit an MA bar. From sports bars to country bars to martini bars, we have them all listed for you. Read through our complete list and find the bar that you would like to visit next time you're in MA! Watch the big sports game with other fans at one of these MA sports bars. 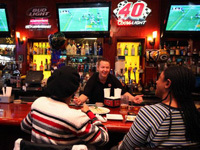 Have some drinks and watch as your favorite team steps into the arena at a sports bar in MA.